America remains deep in mourning as an investigation casts more light on the elementary school massacre that claimed the lives of 26 people, 20 of them children all aged six-seven years. 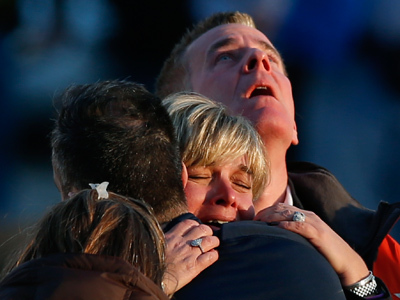 The tragedy again brings up the issue of US gun control. Chilling details have been unveiled by Connecticut State chief medical examiner who commented that all of the victims in the Sandy Hook Elementary School were shot more than once. He added that a “long weapon”, alluding to a rifle, was used in the shooting and that it caused all the deaths, which were ruled as homicides. Law enforcement sources earlier said that the attacker used three guns- a semi-automatic .223-caliber Bushmaster rifle, Glock and Sig Sauer pistols. 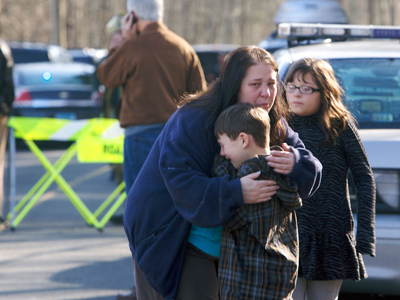 Police in Newtown released the full list of names of the shooting victims. The list includes six adults and 20 children – 12 girls and eight boys all aged from six to seven. All six adults were women. Asked if the children suffered, Chief Medical Examiner Dr. H. Wayne Carverpaused. "If so," he said, "not for very long." No details however were revealed on the motives that could have triggered the 20-year-old suspect, Adam Lanza, to go on the rampage that has become one of the deadliest shooting sprees in US history. Contrary to earlier news reports, the investigation did not find a connection between Sandy Hooks and Adam’s mother Nancy Lanza, whom he killed at their home before staging the school massacre. 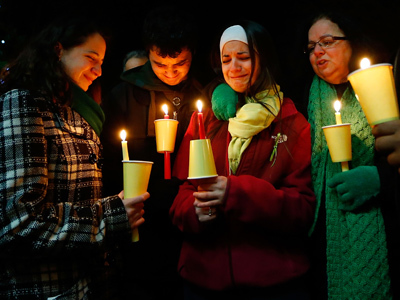 A huge crowd gathered in Stratford, Connecticut, for a candlelight vigil in honor of Victoria Soto, the first-grade teacher at Sandy Hook Elementary School who was shot and killed while protecting her students. She was 27. Meanwhile some families of the victims have for the first time spoken out about their loss. Police have repeatedly asked the media to respect the privacy of the mourning families. The father of 6-year-old Emilie Parker told a press conference that he expressed no anger about the tragic incident. Robbie Parker thanked everyone for the condolences and extended his own to relatives of the victims, as well as to the family of the shooter. "It is a horrific tragedy and I want everyone to know that our hearts and prayers go out to them. This includes the family of the shooter," said Parker. "I cannot imagine how hard this experience is for you. Our love and support goes out to you as well." The sheriff of Rockingham County, New Hampshire, delivered a statement on behalf of James Champion – the brother of Nancy Lanza. Peter Lanza, the father of alleged gunman Adam Lanza, also released a statement on Saturday extending his condolences to the families of the victims. Adam’s parents were divorced and the father lived separately. "Our hearts go out to the families and friends who lost loved ones and to all those who were injured. Our family is grieving along with all those who have been affected by this enormous tragedy. No words can truly express how heartbroken we are. We are in a state of disbelief and trying to find whatever answers we can. We too are asking why, we have cooperated fully with law enforcement officials and will continue to do so. Like so many of you, we are saddened, but struggling to make sense of what has transpired." 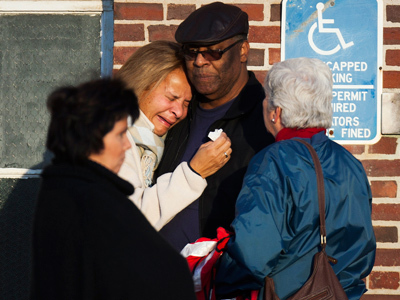 The recent shooting in Newtown, Connecticut, now adds to the long list of similar tragic incidents, which occurred across the United States in recent years, once again making a strong case for stricter gun laws. In his weekly address to the nation on Saturday, President Barack Obama once again urged “meaningful action” in the wake of the tragedy. “As a nation, we have endured far too many of these tragedies in the last few years. An elementary school in Newtown, a shopping mall in Oregon, a house of worship in Wisconsin, a movie theater in Colorado, countless street corners in places like Chicago and Philadelphia,” Obama said in the statement. The scenario that unfolded in Newtown is becoming all too familiar for Frank DeAngelis, the principle of Columbine High School where twostudents killed 12 classmates and then themselves in 1999. "It's a reminder of how vulnerable we are as a society," DeAngelis said. "As a society we have to come together, we have to stop these senseless deaths." However guns advocacy groups seem to have not learnt any lesson from the tragedy, with some even enforcing their calls for widespread guns ownership. In a rather unusual response to the events in Connecticut, the executive director of the advocacy group, Guns Owners of America, claimed that thetragedy could have been averted if there were guns in the school.